FIRST® LEGO® League Jr. Team #12215, the “Techno Queens” from Jericho, who are headed to the FIRST LEGO League Jr. World Festival Expo in Detroit, taking place on April 27. This team of six earned the special distinction of representing Long Island at this world event following a series of FIRST LEGO League Expos that were held at Mineola and Longwood High Schools in early March. FIRST® LEGO® League Team #92, the “Sea Lions” from Seaford, and Team #5357, “Imagination in a Nutshell” from Jericho, will both be competing at the FIRST LEGO League World Festival in Detroit, April 25-28. FIRST LEGO League Team #10425, the “Harborfields Library Purple LEGO Eaters” from Centerport, will represent long Island at the FIRST LEGO League North American Open Championship at LEGOLAND in Carlsbad, California, May 19-21. FIRST LEGO League Team #15067, the “Robo Falcons” from Jericho, will attend the FIRST LEGO League Razorback Invitational in Fayetteville, Arkansas, May 16-19. Each of these teams earned the opportunity to advance following the FIRSTLEGO League SBPLI Long Island Championship at Longwood High School on March 4. FIRST® Tech Challenge Team #5477, “Innovo” from Hewlett; Team #4137, the “Island Bots” from East Setauket; and Team #9421 the “Hydrofluoric Robotics” from Greenlawn; each competed at the FIRST Tech Challenge Super-Regional Championship in Scranton, Pennsylvania, March 16-18. 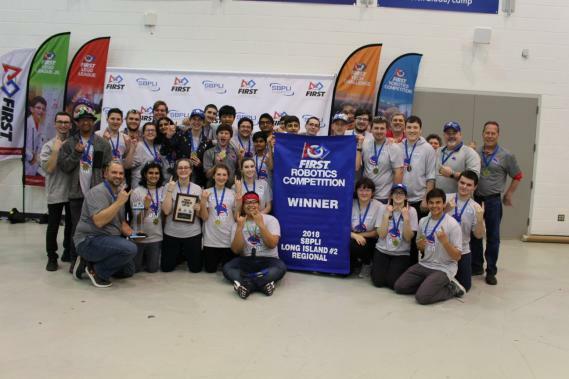 These teams earned the chance to compete at that post-season event following the FIRSTTech Challenge SBPLI Long Island Championship at Smithtown High School on February 9. A total of 15 FIRST® Robotics Competition teams will represent Long Island at the FIRST World Championships in Detroit, April 25-28. Included among them is Team #810, the “Mechanical Bulls” from Smithtown, which won the SBPLI Long Island Regional FIRST Robotics Competition #2 on Saturday, April 14, along with the event’s coveted Chairman’s Award and the Woodie Flowers Finalist Award. Also advancing is Team #5016, “Huntington Robotics” from Huntington, which won the Chairman’s Award at SBPLI Long Island Regional #1, on April 11, earning them a guaranteed spot. Team #6806, the “Mineola Wild Reds” from Mineola, the region’s only rookie team for 2018, took home the Rookie All-Star Award at Regional #2; while Team #2869, the “Regal Eagles,” earned the Engineering Inspiration Award at Regional #1; both will compete in the Championship. Further FIRST Robotics Competition teams from the region set to participate in the FIRST World Championship are: Team #533, the “PSIcotics” from Lindenhurst and Team #2638, the “Rebels” from Great Neck, were each finalists in Regional #1; as well as Team #870, “Team R.I.C.E.” from Southold; Team #1468, the “J-Birds” from Hicksville; and Team #3171, the “Hurricanes” from Westhampton Beach, were each finalists at Regional #2, and all secured Wildcard opportunities. Team #263, the “Sachem Aftershock” from Ronkonkoma; Team #527, the “Red Dragons” from Plainedge, whose member, Nicole Jacobsen, earned the Dean’s List Award; and Team #3950, “RoboGym Robotics” from Glen Head, which earned the Team Spirit Award; were each waitlisted following Regional #2 and will now also attend the Championships. Team #4458, the “Infernobotix” from Center Moriches, which won the Tech Valley Regional in Troy, New York on March 17; Team #329, the “Mohawks” from Patchogue-Medford, which was awarded the Engineering Inspiration Award at the Hudson Valley Regional in Suffern, New York on March 25; and Team #3624, the “ThunderColts” from Huntington Station (Half Hollow Hills), which earned a wildcard spot following the Tech Valley Regional, are all also competing at the 2018 World Championships. “We are extremely proud of all the hard work and dedication that our thousands of FIRST Long Island students put into the 2018 season,” says Bertram Dittmar, Executive Director, SBPLI/FIRSTLong Island. "And, a heartfelt Congratulations to all our teams advancing to post-season events. We know you'll make us all proud. Thank you, also, to the hundreds of volunteers who took the time to work alongside these teams and who participated at, or helped organize, our events. It was another exciting, record-breaking year, complete with the addition of events and teams across all programs, and it would not have been possible without all of you." For more information on SBPLI or FIRST Long Island, please visit www.sbpli-lifirst.org.